Collection>The danish golden age>C. W. Eckersberg>Eckersberg C. W.
Oil on canvas, 43 x 62 cm. 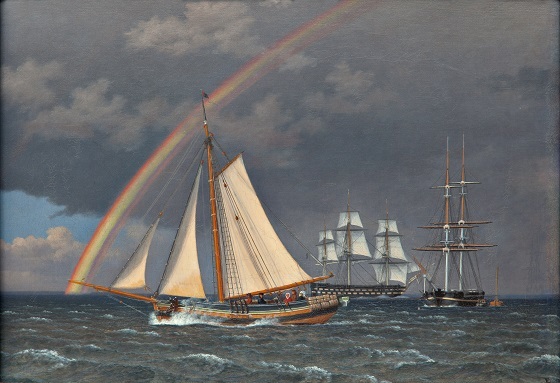 In marine painting, Eckersberg could pursue his interest in objective sense-based reality and the study of perspective. The artist not only studied the ships at a distance, he also participated in both shorter and longer trips as a passenger, where he studied everything from weather conditions and sailing techniques to ship design, which he reproduced with characteristically scientific, detailed precision. He kept meteorological journals, where he noted how much it rained, whether the sun shined and temperatures. Eckersberg’s favourite ship was of the type called a frigate, which was a fully rigged, fast warship. Eckersberg studied under Nicolai Abildgaard and art historically, he has been proclaimed the Father of Danish Painting, because he was the first professor to establish a school and his students include many of the most famous Golden Age painters. He broke with the idealising art of the 1700s and introduced a new form of realism based on nature studies and compositional principles. In 1810, he won the Academy’s prestigious gold medal, and subsequently spent a year in Paris studying under the great neo-classical painter Jacques-Louis David. Eckersberg was the very first to introduce direct study from nature at the Art Academy, and in doing so, had a decisive impact on the development of Golden Age art in Denmark. He was greatly influential for numerous young artists such as Martinus Rørbye, Christen Købke, Constantin Hansen, Jørgen Roed and Wilhelm Marstand.